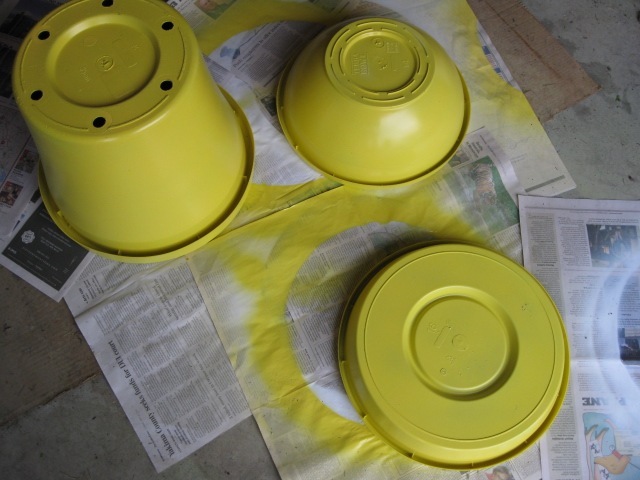 As you may have seen on some of my previous posts I’m cuckoo crazy for spray paint lately. As I walk around my house I can’t help but look at objects in a different light. Ooh, that’s old, I could spray paint that. Ahhh, I was going to get rid of that, but what if I spray paint it? Are you getting the picture? The two males in my house just roll their eyes. I’m one of these persons that speed ahead sometimes before reading all the directions. I call it OTJST, on the job spray training. I guarantee I don’t always know if I should or shouldn’t use primer but I’m learning. Part of that learning is checking out other blogs. Today I was looking at one in particular and and I want to give a props shout out to Kate at Centsational Girl. Kate is, in my opinion, the best of the best, the spray paint queen, the subject matter expert when it come to the “art of spray”. Check out her FAQs here and also take some time to check out her Project Gallery. You will be amazed! Now, on with the birdbath. Several posts ago I asked if anyone could guess what this was going to be? Here’s how I made it. 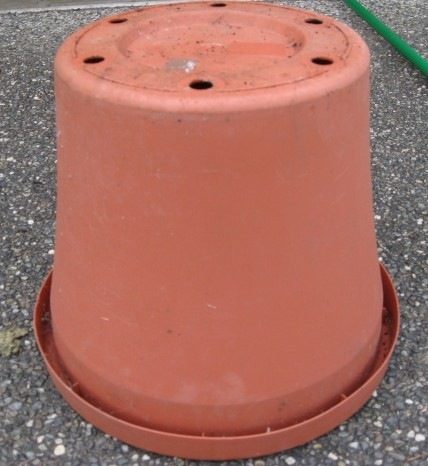 First, let it be known, I am the keeper of pots and this old dirty one was sitting on the side of my house. 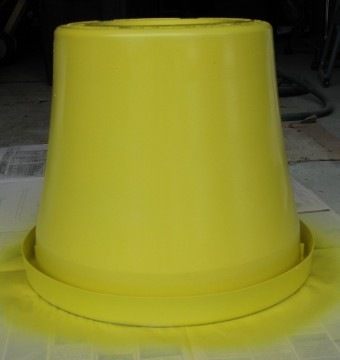 I used Simple Green to clean, primed it, then painted it a very bright yellow (Rust Oleum Primer and Sun Yellow). 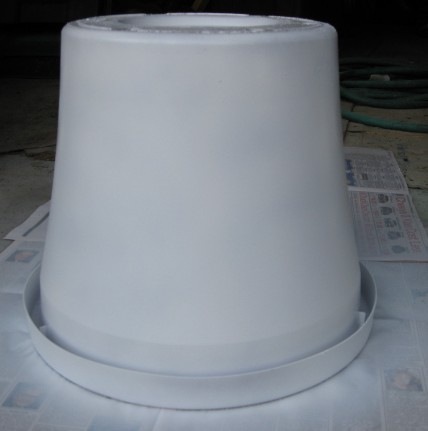 I also took a base and a bowl and primed and painted them as well. I had to sleep on that yellow for a couple of days and decided it was too bright for my yard. I went to my favorite Rust Oleum color, Apple Green. 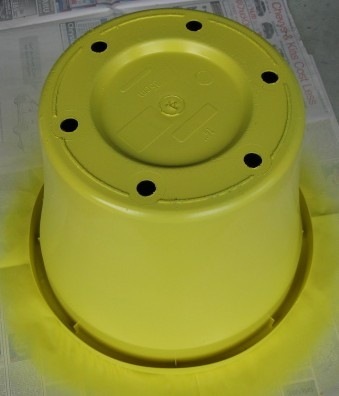 I sprayed a very light, almost a mist of the apple green over the yellow. I also used my glove to make some swirly designs on the bottom pot. That was initially by accident and then I liked the look. I finished it off with some Rust Oleum Gloss spray to protect it. Easy to assemble. 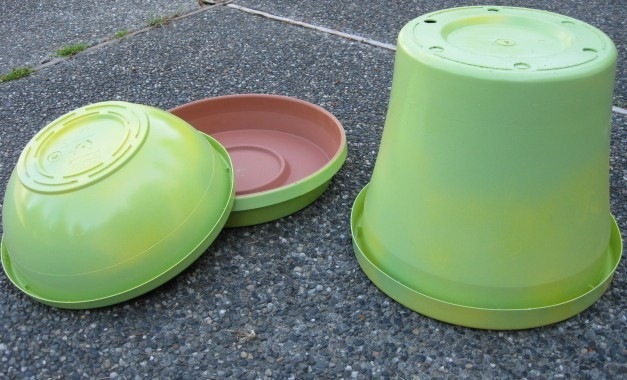 Large pot is upside down with the bowl placed on top. I put some rocks in the bowl to weight it down. Then I placed the base on top of the bowl. 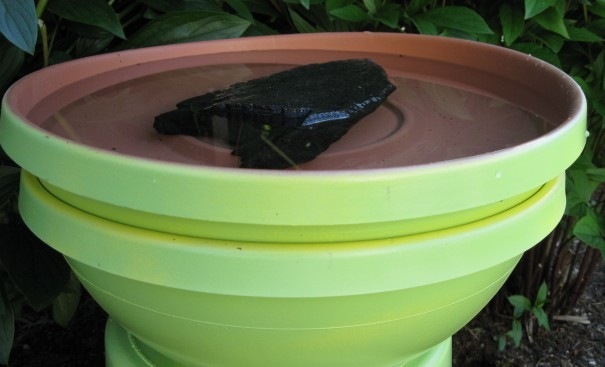 Add a rock for the birds to perch on and water. Voila! I love how it just nestles in with the Peony bushes. I’ve linked this post to…. 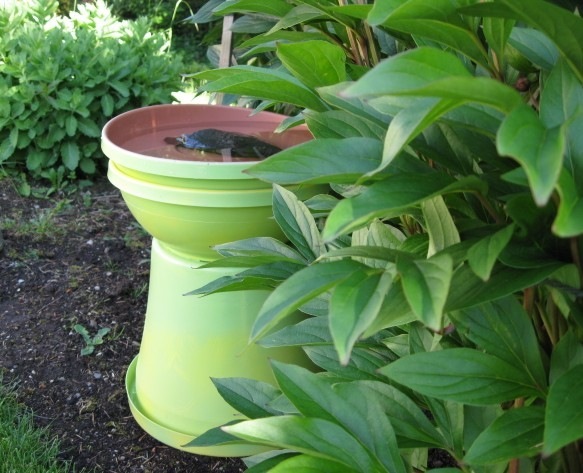 This entry was posted in GARDENING, Outside and tagged bird feeders, birds, peony, Rust Oleum. Bookmark the permalink. Oh my goodness Lattenene, that is so very creative! I adore the color you chose, how clever of you! I would never have thought of that, brilliant repurposing!!! Kate, thanks so much! I had such fun doing it. 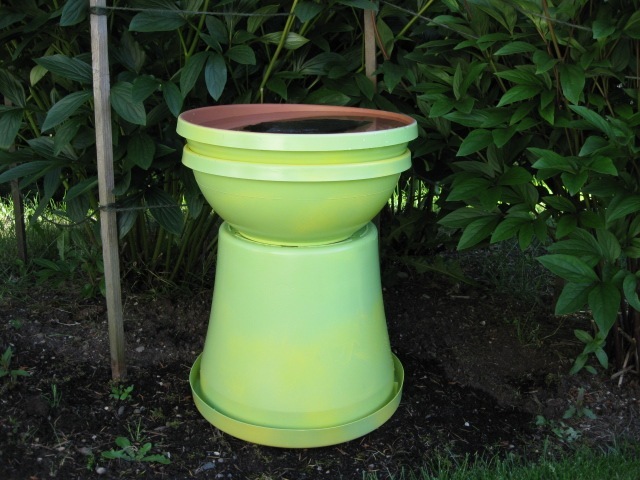 I never would have thought of this – I made a one stacking flower pots and painting them – but I love this! Thanks Michael – it was fun to make. Give it a try!